Hi everyone. I thought I ought to say hello as I have been hanging around for sometime. Well I am based here in the U.K. Always wanted to go to the Salt nad last year had the opportunity. Alway been around cars since I was a kid. Went to my first drag race in 1964 and still go. More into the Nostalgia scene and help out the Rar Trap Fuel Altered when I am in the US. I raced Pro Stock bikes in the early 80's here in the U.K. I was very kindly offered a drive in a Rat Trap LSR Dodge to see how I got on. Well of course I got Salt Fever. Incurrable they say and they are quite right. I got my C class licence. Which I was really proud of. Brian Hope of Rat Trap Racing asked if I would like to try 7551 rear engined roadster. I got my B class licence in that. That brings me up to date. We have put together a program for this year and the plan is to go faster than last year. But we all know the best laid plans don't always happen. Really excited about my next trip in a few weeks. I need to thank so many people ...my family for letting me do this, the Hope family especially ROn and Brian, Carl Olson, Steve Gibbs and Al Teague for guidance and encouragement..Bob and Sharon Muravez (Floyd Lippenott) who have adopted me and who are the most wonderful people. Ed Iskenderian..boy where would I be without this genius. I cannot thank Ed enough and I am so proud to be able to carry the name ISKENDERIAN on the side of the race car. Anyway that enough from me. See you boys and girls on the salt. Very best of luck to you and the team Geoff for your next visit. Keep it straight and go fast mate. And enjoy every second of it. My name is Nik. I live in Flagstaff and have felt drawn to Bonneville salt flats racing for a lot of years. I've finally decided that I've got to go to the races! So, currently looking to book a room and make it happen this year. I want to just check it out this year, then start building a race car. I'll probably start with the 130 MPH club with either my '58 Chevy Apache or my '68 GMC C15. Anywho, I thought that this would be the best place to start. I feel an addicton coming on! I thinknthat my wife senses it, too! I'm excited to read and learn and hopefully meet a bunch of people in September! I'm an engineer with a long time interest in LSR, I live in the UK. Researching electric LSR, with a view to possibly building a car for an attempt on not only the electric LSR, but also the wheel driven record once I've completed my current project. Howdy, Mark, and welcome to the asylum. It's nice in here -- everyone has the same affliction. Electric stuff: Come on and join the fun. You're gonna have to run to keep up with the electrics already out there in the world of LSR - Eva and the Buckeyes and two-wheelers and on and on. There's plenty of room for you to join us. Like I said, I have to finish my current project, that's due to run in October before I start anything in earnest. Joined recently, I'm the son of frequent poster Rex Schimmer. I fill the roll of driver/welder/etc in the "Schimmer and Son" IF/L car. I've been to a few LSR events in the past, but this year at Bonneville will be my first time participating. Most of my racing experience is from doing autocrosses and hillclimbs in my '72 Datsun 510, so this is going to be a big change for me. Really looking forward to it though! A picture of my the racing I am used to...a little more turning involved than LSR. Welcome Duke, That is an old record. It is the record that got me in the 2 club. I went to the salt for 20 years before we got that record. I wish you all the luck in the world that it doesn't take you near that long to get the record. Hello everyone my name is Jeff Schlemmer from MN and like all of you, I have an addiction. 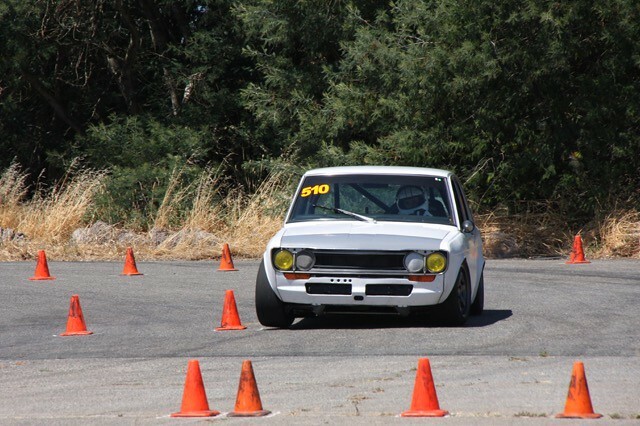 We just built a Datsun pickup to race production class (3 year build) and in a couple weeks, if all the stars align properly, we'll pass tech and see you on the salt! Look for a group of 5-10 guys running around an old blue and orange mini-truck like chickens with their heads cut off. Its our first go at the ultimate bucket list item: a record on the salt. If you see us doing somethign stupid, its because we don't know any better. Set us straight and we'll share cold beverages. Best of luck to all at Speed Week!!! Racing is the evil modification of insanity. Oh, man, Jeff, do you realise what you're getting into? It's probably too late, so there's nothing you can do but dome look Nancy me up when you're out there. See you on the salt. Hello All, Kerry Alter here from Phoenix Az., I am a Land Speed Racer, addicted to SPEED and I am my own Alterego. I have been lurking a while but just registered. I have raced a Bonneville for the past 10 years and achieved multiple World and National Records in the 1000cc and 1350cc MPS motorcycle classes. Unfortunately I will not make it to Bonneville this year because I lost 4 engines in the last year, one on the dyno, two on the salt and one at the drag races (expensive)!! Anyone following whats going on in Bolivia now? It should be exciting to see what Rocky and Al Lamb can do, wishing them and all the racers the best of luck. I'm a Land Speed Racer and I'm addicted to SPEED. I am my own Alterego! I currently don't have a land speed car, but plan to build a lakester. I just have to get a few other projects done first. I work at Hollywood Hot Rods to find these projects. Nothing else is that interesting. Haha.